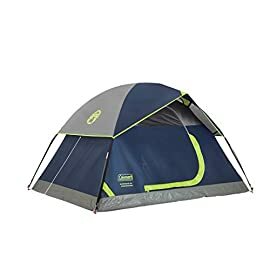 HAMMOCK TENT HEAVEN IN FULLY PATENTED DESIGN – Sky Tent 2 brings hammock camping to a new level of comfort and convenience. 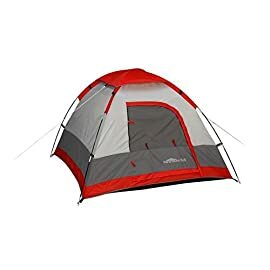 Sky Tent 2 allows you to stay dry from the rain, safe from the bugs and provides ample space for you and your gear. 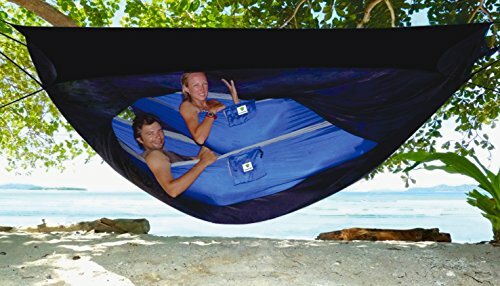 Our innovative design can accommodate up to 2 hammocks so both you and a friend can hang together in a cozy hammock tent shelter. 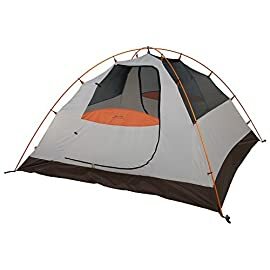 INSULATED – Ripstop waterproof nylon base layer helps retain body heat, provides storage for light weight items and creates a tough floor for using Sky Tent on the ground. New loops on corners of the floor allow floor to be staked to the ground. 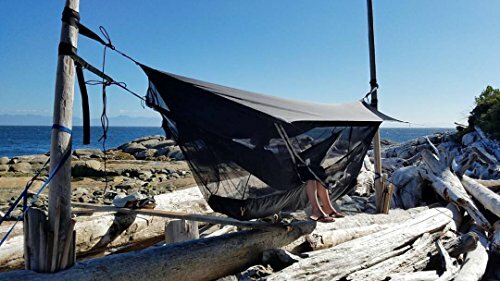 Hammock Bliss Sky Tent 2 (ST2) is a revolution in the making, bringing hammock camping to a new level of comfort and convenience. Stay dry from the rain, protected from the bugs with ample space for you and your gear. 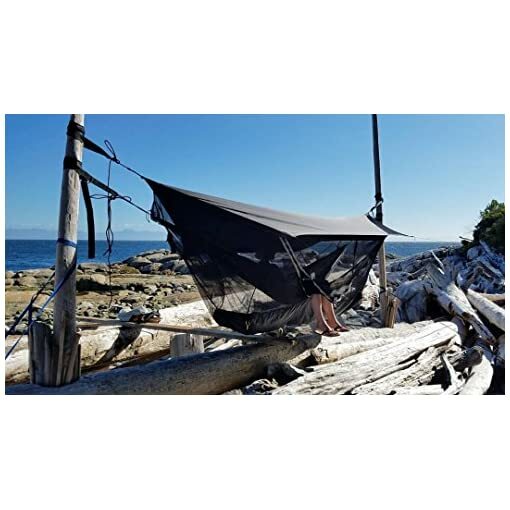 ST2 acts as a tent for your hammock off the ground and can accommodate up to 2 hammocks so both you and a friend can hang together. 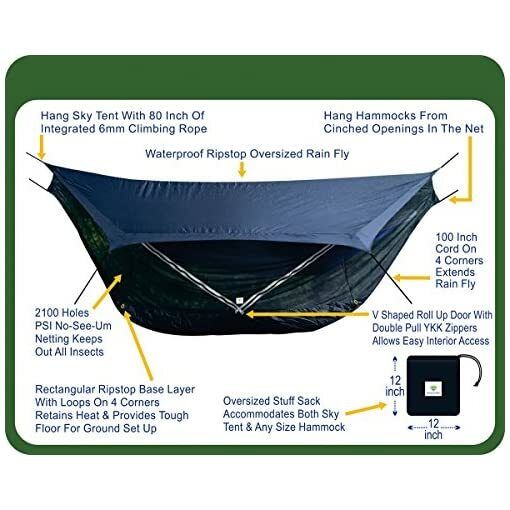 The oversized rip stop rain fly provides complete protection from the rain for both your hammock and your gear. 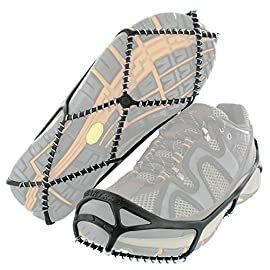 2100 holes per square inch no-see-um netting keeps out the smallest bugs and reduces the chilling effect of the wind. The current version of ST2 features some big updates including the new V shaped door. The new V door rolls up and can be toggled on top to allow easier access to the interior space. Double pull YKK zippers make it a breeze to get into and out of your sky space. 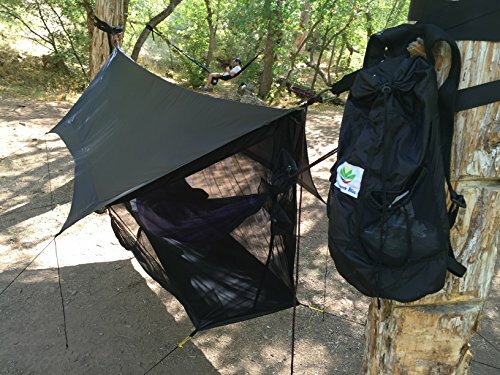 138″ / 350 cm of 6mm climbing rope provide a protected ridgeline below the rain fly. 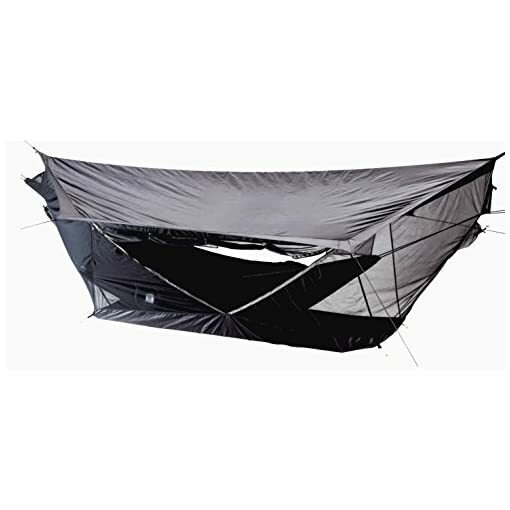 The climbing rope extends 80″ /203 cm outward on each side to securely hang your Sky Tent. A prusik knot permits you to tension the ridgeline and move the rope from one side of the Sky Tent to the other. 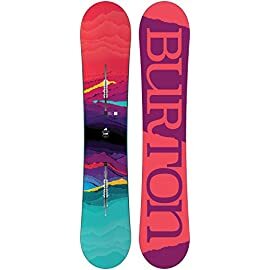 There is 100″ / 250 cm of cord on the 4 corners of the rain fly with ladder lock buckles for easy tensioning. 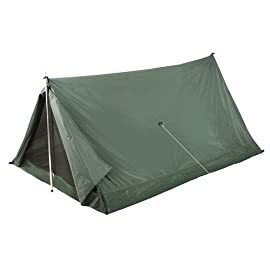 The Sky Tent base layer or floor is now made with the same waterproof rip stop nylon as the rain fly and this layer helps retain body heat and provides storage for light weight gear. 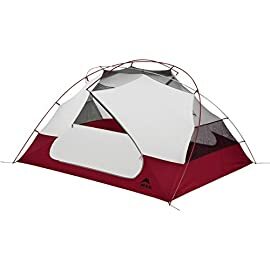 We redesigned the shape of the floor to mirror the rectangular shape of most sleeping pads and added loops at the 4 exterior corners. 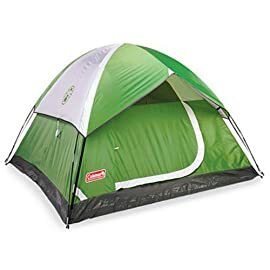 If you wish to use your Sky Tent as a conventional ground tent, you’ll on easily stake out the 4 exterior corners of the floor and use a hiking pole to hold up one or both ends of the rain fly. 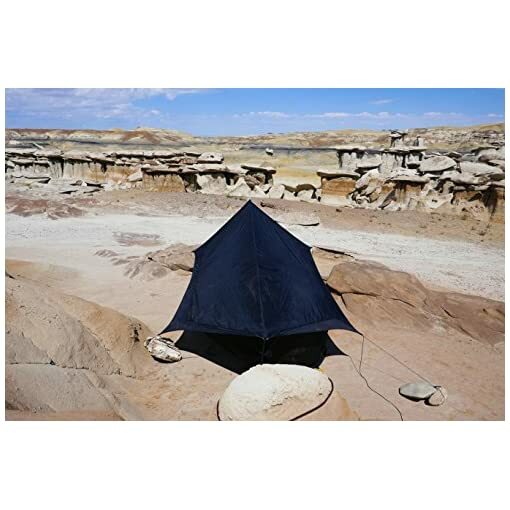 There is numerous space in the waterproof stuff sack to fit your Sky Tent, straps and any sized hammock. 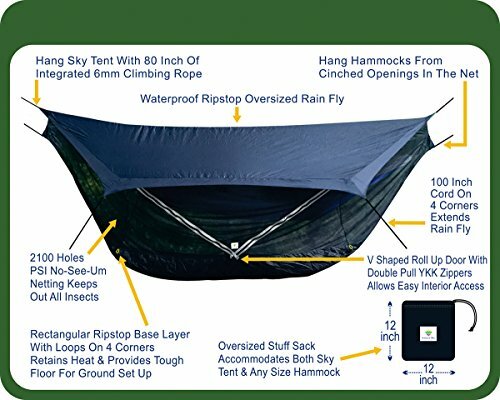 Sign up for the Sky Tent revolution – hammock camping will never be the same. 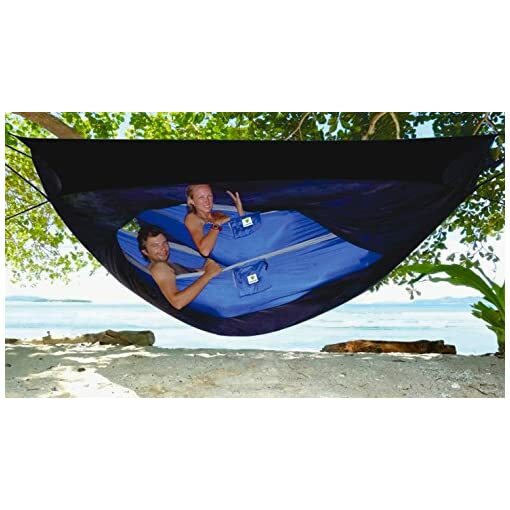 NOTE – Hammocks are sold one by one and don’t seem to be included with ST2. 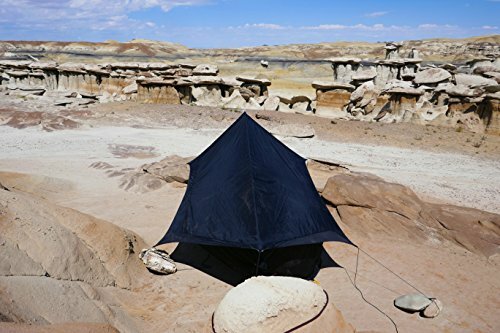 HAMMOCK TENT HEAVEN IN FULLY PATENTED DESIGN – Sky Tent 2 brings hammock camping to a new level of comfort and convenience. 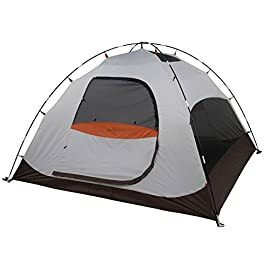 Sky Tent 2 permits you to stay dry from the rain, protected from the bugs and provides ample space for you and your gear. Our innovative design can accommodate up to 2 hammocks so both you and a friend can hang together in a cozy hammock tent shelter. 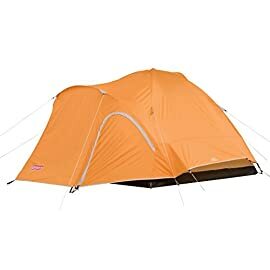 INSULATED – Ripstop waterproof nylon base layer helps retain body heat, provides storage for light weight items and creates a tough floor for the usage of Sky Tent on the ground. New loops on corners of the floor allow floor to be staked to the ground. 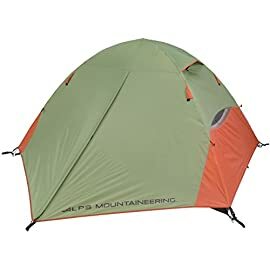 TECH SPECS: Oversized waterproof stuff sack for easy pack and go storage. 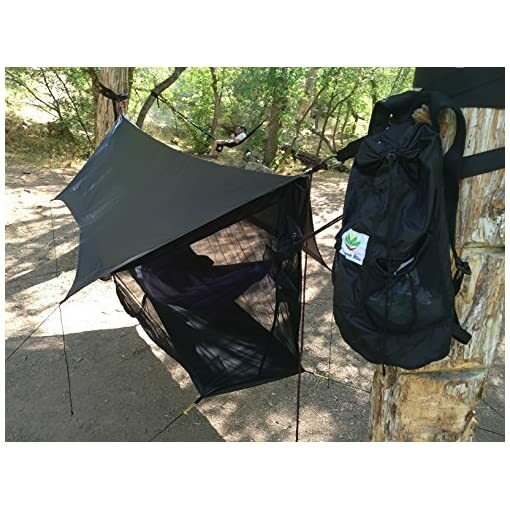 Stuff sack accommodates both Sky Tent and any sized hammock for added convenience on the trail – Dimensions 138″ long x 73″ wide x 43″ high / 350 cm long x 185 cm wide x 110 cm high – Weight 42 oz / 1200 grams – Sky Tent Fully Packed – 12″ x 12″ x 4″ / 30 cm x 30 cm x 10 cm – NOTE – Hammock is not included with the Sky Tent.